Nestled at the heart of distant galaxy, Messier 87, which is 55 million light-years away in the Virgo galaxy cluster, the black hole measures just under 40 billion kilometres across, which is ~3 million times the diameter of the Earth. It has a mass 6.5 billion times that of the Sun. Although supermassive black holes are relatively tiny astronomical objects, this was predicted to be one of the largest viewable black holes from Earth, making it the perfect target for the Event Horizon Telescope (EHT). The EHT is an international collaboration specifically set up to image a black hole by linking eight ground-based radio telescopes globally to make an Earth-sized virtual telescope with unprecedented sensitivity and resolution. Following decades of observational, technical and theoretical work, the breakthrough was announced today in a series of six papers published in a special issue of The Astrophysical Journal Letters. It was achieved by a team of more than 200 researchers from Africa, Asia, Europe, North and South America. “We have accomplished something many thought impossible by imaging the shadow of a black hole and it provides the strongest evidence to date that such evasive and enigmatic entities do indeed exist. 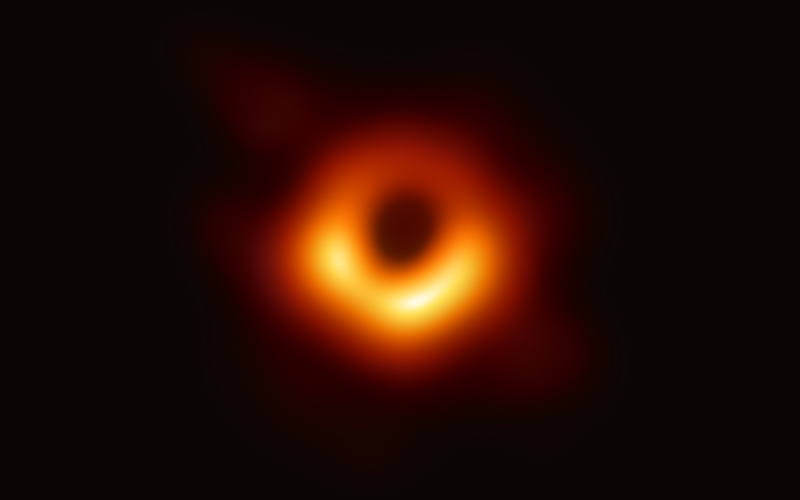 It’s the closest we can get to imaging a black hole, which is an object with such a strong a gravitational field that no light or matter can escape,” said Dr Ziri Younsi (UCL Mullard Space Science Laboratory), part of the EHT collaboration. “This observation lays the foundation for future studies of black holes and could play a crucial role in our understanding of the behaviour of light and matter in the most extreme environments in our Universe." Black holes are extraordinary cosmic objects with enormous masses but extremely compact sizes. They dramatically affect their environment by warping spacetime and super-heating any surrounding material. "If immersed in a bright region, like a disc of glowing gas, we expect a black hole to create a dark region similar to a shadow — something predicted by Einstein’s general relativity that we’ve never seen before," explained chair of the EHT Science Council Professor Heino Falcke (Radboud University, the Netherlands). "This shadow, caused by the gravitational bending and capture of light by the event horizon, reveals a lot about the nature of these fascinating objects and allowed us to measure the enormous mass of M87’s black hole." M87’s black hole is around 2.5 times smaller than the shadow it casts, which is surrounded by a ring-like structure with features that closely matched theoretical models. "Once we were sure we had imaged the shadow, we could compare our observations to extensive computer models that include the physics of warped space, superheated matter and strong magnetic fields. Many of the features of the observed image match our theoretical understanding surprisingly well," said Dr Paul T.P. Ho, EHT Board member and Director of the East Asian Observatory. “This makes us confident about the interpretation of our observations, including our estimation of the black hole’s mass." The observations were made in 2017 using a technique called very-long-baseline interferometry which synchronises telescopes around the world and exploits Earth’s rotation to form one planet-sized telescope. They collected enormous amounts of data – roughly 350 terabytes per day – which was stored on hard drives and flown to supercomputers in Germany and the US for painstaking conversion into an image. "Breakthroughs in technology, connections between the world's best radio observatories, and innovative algorithms all came together to open an entirely new window on black holes and the event horizon," said EHT project director Professor Sheperd S. Doeleman (Center for Astrophysics, Harvard & Smithsonian). "Although they are relatively simple objects, being wholly characterisable in terms of a few fundamental parameters, black holes raise some of the most complex questions about the nature of space and time, and ultimately of our existence," concluded Dr Younsi.